An unaltered photocopy of your DD-214 or other military issued document clearly displaying your award of the Coast Guard Arctic Service. The Arctic Service Medal was established by Admiral Owen W. Siler, Commandant of the Coast Guard, on May 20, 1976. The Arctic Service Medal has been retroactively awarded for qualifying service since January 1, 1946. -- During winter operations (November 1 to April 30) aboard a Coast Guard vessel operating in polar waters north of latitude 60 degrees North in the Bering Sea, Davis Strait, or Denmark Strait. -- At the Radio Station at Barrow, Alaska or any of the following Loran Stations: Cape Athol, Greenland; Cape Christian (Baffin Island), Canada; Port Clarence, Alaska; Bo, Norway; or January Mayen Island, Norway. -- The medal can also be earned by crew members of Coast Guard aircraft flying to or from any of the stations listed above or any shore stations north of the Arctic Circle. The time required is a cumulative total of 21 days, with a flight in and out within a 24 hour period counting only one day. 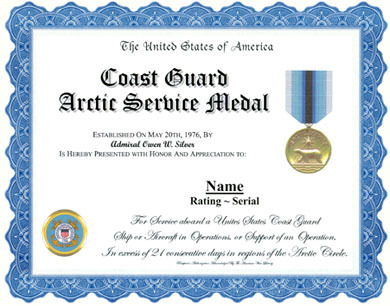 On a case by case basis, awards can be made to other personnel including civilians who participate in Coast Guard Arctic Programs, perform significant service, and share the hardships and hazards of the operation. The Arctic Service Medal is worn after the Antarctica Service Medal and before the Armed Forces Expeditionary Medal. No attachments have been authorized for this medal. The first recipient of the Arctic Service Medal is not known. 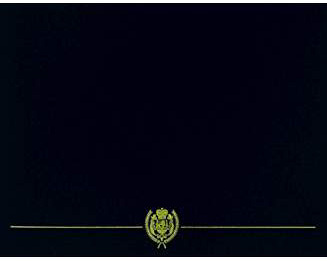 The Arctic Service Medal was designed by Arnold P. Simmons of the Army's Institute of Heraldry. In the center of a bronze medallion one and a quarter inches in diameter, a polar bear is shown in profile with its head to the left. Above the bear and following the contour of the upper quarter of the medal, the words ARCTIC SERVICE. An eight pointed star is above the bear's back (and beneath the inscription). The bear stands on a sheet of ice represented by a straight line; below the line are two undulating lines. The polar bear, whose sole habitat is the Arctic region, alludes to the polar region and to the Coast Guard Cutter Bear. The star represents the Stella Polaris, prominent in the northern sky. In the center of a bronze medallion one and a quarter inches in diameter, the Seal of the United States Coast Guard, under whose authority the medal is awarded is displayed. The ribbon is the reverse of the Antarctic service Medal, thus indicating service at its opposite (North) pole.